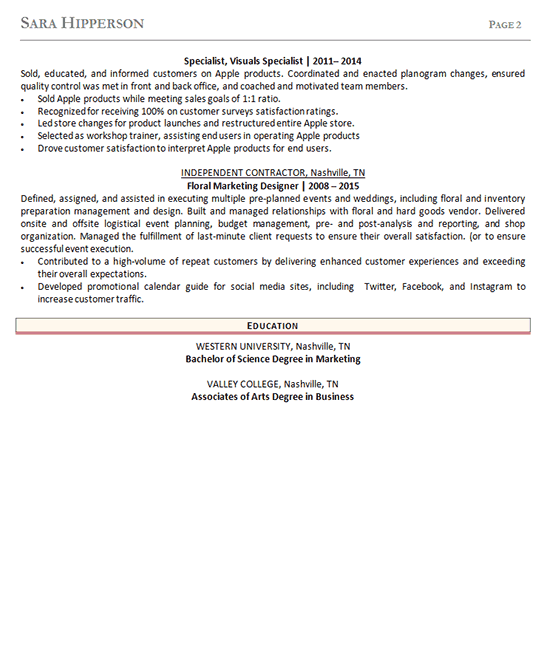 This resume was formatted to provide a visual impact with a focus on the summary. The opening statements summarize Shaun’s experience and introduces his diversified product development and project management skills as his key attributes. The “Areas of Excellence” section contains keywords appropriate to his experience and an at-a-glance information to managers. Immediately following, is a recount of his professional experience starting with his current role. It details his work process flow knowledge, continuous improvement, and quantifiable revenue savings for the company. Shaun’s two positions with Hess Design are listed separately to highlight his varied achievements and contributions. The writer selectively displayed his relevant accomplishments with bullet points. Page two continues to build on prior positions and draws to a close of Shaun’s education. Versatile general manager with expertise in all aspects of driving multi-million-dollar projects meeting key program deliverables, product development, vendor and contract negotiations, and budget management. Committed to sustaining robust, streamlined systems that respond to business objectives. Excel in managing multiple projects concurrently with strong detail, problem-solving and follow-through capabilities. Demonstrated ability to motivate and build cohesive teams that achieve results. Lead continuous improvement in process workflow in custom design, purchasing, sales, order management, customer service, and warehouse operations. 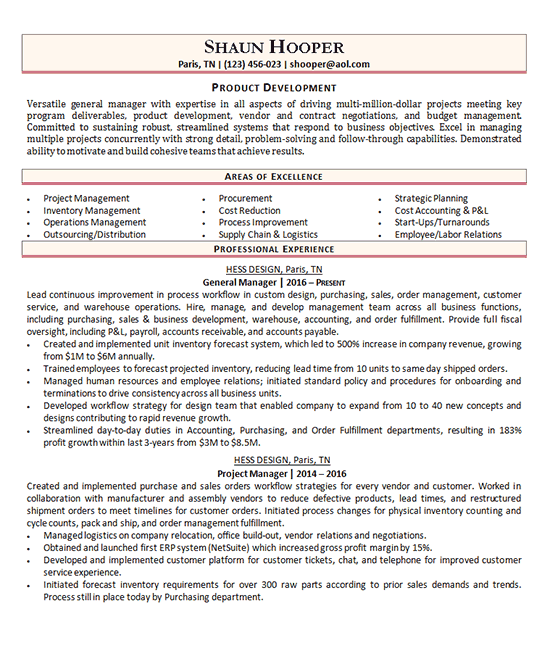 Hire, manage, and develop management team across all business functions, including purchasing, sales & business development, warehouse, accounting, and order fulfillment. Provide full fiscal oversight, including P&L, payroll, accounts receivable, and accounts payable. Created and implemented purchase and sales orders workflow strategies for every vendor and customer. Worked in collaboration with manufacturer and assembly vendors to reduce defective products, lead times, and restructured shipment orders to meet timelines for customer orders. Initiated process changes for physical inventory counting and cycle counts, pack and ship, and order management fulfillment.